Anne is the only daughter of Queen Elizabeth II and the Duke of Edinburgh. She was born on August 15, 1950, two years after her brother Charles. She was baptized Anne Elizabeth Alice Louise. 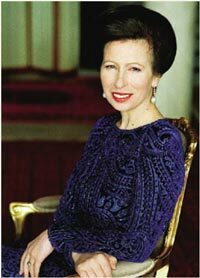 People simply referred to her as Princess Anne, until her mother, the Queen, gave her the title of Princess Royal when she was 37. The princess demonstrates a deep love and concern for children. She has devoted years of life to causes such as Save the Children, of which she has been the president for the last 30 years. She is also an avid horsewoman with a passion for riding. She has taken part in many contests and championships receiving, along the way, many accolades and medals, among them SportsWoman of the Year. The Princess� first marriage to Lt. Mark Phillips took place on November 14, 1973, but was unfortunately dissolved in April of 1992. Her two children, Peter Mark Andrew Phillips and Zara Anne Elizabeth Phillips were products of this marriage; they don�t hold any royal title as their father has no hereditary title himself. Then, in December 1992 the princess wed Captain Timothy Laurence. Today she is President or Patron of hundreds of charities and organizations attending many public engagements each year in the course of her Royal duties. She was President of the British Olympic Committee and was then elected a member of the IOC. In 1994 she was appointed a Knight of the Most Noble Order of the Garter.